The appearance and habits of the naked mole rat enthrall scientists and observers alike. Naked mole rats are eusocial mammals, with a social system structured in service of a queen, much like bees. Naked mole rats have their own special building where you can watch them interact and explore their burrow system at any time of the year. Naked mole rat colonies usually average around 70 members, but colonies as large as 295 have been observed. This is one of only two known eusocial mammal species. In this system, there is a single queen supported by a caste of workers and breeders, just like bees, wasps, termites and ants. Naked mole rats are fossorial, living only underground, and use complex burrow systems. Tunnels connect nest chambers, toilet areas and food sources. Each chamber acts as a specific “room” with a specific purpose. Workers work assembly-line style, with the front animals breaking through the dirt while a string of workers behind them sweep the soil through the tunnel system to the surface, where another worker kicks the dirt up onto the ground above its head. Few predators can reach naked mole rats in their underground burrows, but snakes are a constant threat with their ability to slide into the tunnel systems. Naked mole rats are more closely related to porcupines, chinchillas and guinea pigs than they are to rats, and they are not related to moles at all. They are also not completely naked. They have sensory whiskers on their faces and tails, as well as hair between their toes which allows their feet to function as brooms when sweeping away soil. Their skin is pink and somewhat translucent on the underside and light purplish-brown on the backs and tails. Naked mole rats lack sweat glands; their low metabolism helps prevent overheating. To gain heat, they huddle and sleep together in groups. Workers dig through hard-packed soil with their powerful incisors. Naked mole rats’ lips can close behind their incisors to enable them to dig without getting dirt in their mouths. Twenty-five percent of their muscle mass is dedicated to the jaw. By comparison, humans dedicate only 1 percent of their muscle mass to the jaws. When a female becomes queen, she actually grows larger, even though she is already an adult, by increasing the distance between the vertebrae in her spine. The queen is the only member of the colony who is differently-sized; otherwise, males and females look alike. Only the queen reproduces. She mates with one to three males in the colony, and these relationships can remain stable for many years. Because the queen is the only one reproducing, inbreeding is common. The gestation is period is approximately 70 days. A queen can produce a new litter every 80 days and can have as many as five litters a year. The queen has an average of 12 or more pups, but only has 11 mammary glands, so there can be intense competition among the pups for milk. All other individuals in the colony aid in the queen’s reproduction by caring for the pups, foraging and finding food, and maintaining and defending the burrow system. Naked mole rats live in complex underground burrow systems in the arid savannas and grasslands near the Equator. Their population density is highest where their food plants are most abundant. In the wild, these animals dig in search of nutritious roots and tubers that are formed by many of the plant species that grow in arid areas. They obtain all the water they need through their food; they do not drink from pools of water. They are coprophagic, meaning they will eat feces produced by themselves and others. This habit ensures that their crucially important gut microbes are constantly re-stocked and remain in proper balance. At the Zoo, we offer them a variety of produce including sweet potatoes and various fruits, cereal mixtures made for human babies, along with greens such as kale and romaine lettuce. All aspects of the genetics of mole rat colonies and biology are fascinating. 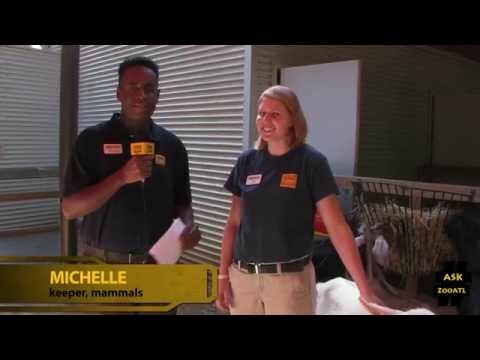 When a naked mole rat passes away at Zoo Atlanta, its remains are sent to two genetic labs at Georgia Tech for study.